I have mixed feelings about Baz Luhrmann's The Great Gatsby though I really wanted to like it. I loved his Moulin Rouge; as a matter of fact, it's one of my favorite films. Same goes for his 1996 Romeo and Juliet. 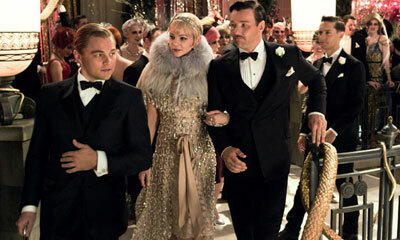 The Great Gatsby is close in style to both of them but doesn't succeed on the same levels. First, the story is not as epic as Luhrmann seems to require. The Great Gatsby is a tragedy in which we don't really feel for the characters, including narrator Nick Carraway - true in the F. Scott Fitzgerald novel as well as the movie. In order to experience the pain of star-crossed lovers Gatsby and Daisy we actually have to like them. As charming as both Leonardo DiCaprio and Carey Mulligan are in those roles, we don't really end up caring about them. Gatsby seems like a bit of a lunatic, though this is certainly one of the more attractive roles we've seen Leo in for a while, and Daisy is too wishy-washy. Though I generally like the idea of mixing the old with the new, I think (Baz Luhrmann) had a grand opportunity to use the music and dance of the time to full effect, but didn't. What I love about the film is the spectacle. It's gorgeous to look at: white gauze curtains floating through a room like lovely phantoms, the castle-like mansion of Gatsby, a re-imagined New York of the 1920s with an ugly, looming coal town just outside its borders, the costumes, the sets, the abundance of flowers, the eerie, blinking green light off Tom Buchanan's deck, across the bay from Gatsby's home, haunting him, perhaps representing the color of his jealousy; the over-the-top parties at the Gatsby mansion, and the decadence of Tom's soirees in his mistress Myrtle Wilson's apartment in Harlem. But one of my arguments (well, two actually) with the overall production is with the music and the dancing. Recalling Luhrmann's earlier films for a moment, I relished the anachronistic feel of Moulin Rouge, how the director used modern music as the score of that Belle Epoque story. I also adored the hip hop, rock, and rap of his Romeo and Juliet set in present-day Miami. However, I think he missed a bet regarding the music for The Great Gatsby, as he inserted a fair amount of modern music into the party scenes, forgoing the use of the jazz and blues of the times - some of the greatest of the 20th century. There is a smattering of it but it deserves to be more prominently featured. He also failed to include enough of the dancing of the era. Yes, there is some Charleston, but mostly, party-goers just move around to the music like they would today. Not that I'm a dance expert, but from what I understand, people didn't dance like that back then. Dance had steps - it was organized. And though I generally like the idea of mixing the old with the new, I think he had a grand opportunity to use the music and dance of the time to full effect, but didn't. I honestly think he pandered to the youth market, thinking young audiences need a story to be modernized in order to like it. Yet I do applaud the acting. DiCaprio and Mulligan are excellent, no argument there. And although I think Tobey McGuire as Carraway is a little too smiley at the beginning, he settles well into his character as the film goes on. Isla Fisher is perfectly ditzy and pathetic as Myrtle, and Elizabeth Debicki as Jordan Baker has just the right smolder. My only disappointment is with Joel Edgerton as Tom Buchanan, Daisy's husband. Granted, Tom's not a likeable character in the book, but I think Edgerton's performance is too shallow. I feel there has to be some redeeming quality about him that makes Daisy (supposedly) love him, but I didn't see it. Too me, he's basically just a dumb jock. I know that many people are hurrying to read the book before they see the movie but I don't think it's necessary. I think the movie captures the essence of the book just fine, though it's much less dreary. Save yourself time and go for the big screen entertainment. There's certainly plenty to like about Luhrmann's Gatsby.